Final Fight! Captain Commando! Battle Circuit! 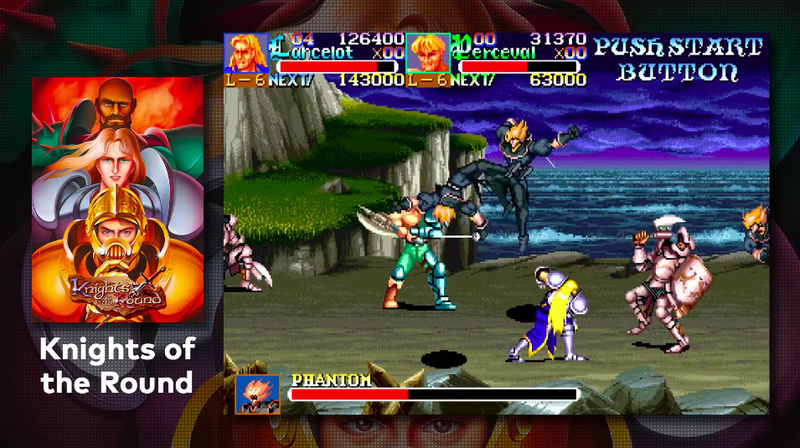 Capcom is bundling up some of its most famous side-scrolling fighters in a slap-happy collection that will have arcade fans giggling with glee. Capcom Beat ’Em Up Bundle includes Final Fight, Captain Commando, King of Dragons, Knights of the Round, Warriors of Fate, Armored Warriors and Battle Circuit. The latter two games have never been available on any console previously, making this quite an interesting digital compendium for fans of the genre. 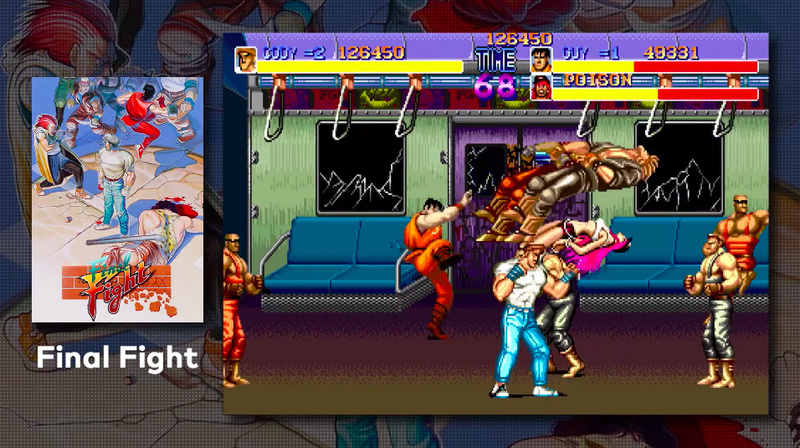 Final Fight needs no introduction, and being able to play an arcade-perfect version on Switch will be a real boon. 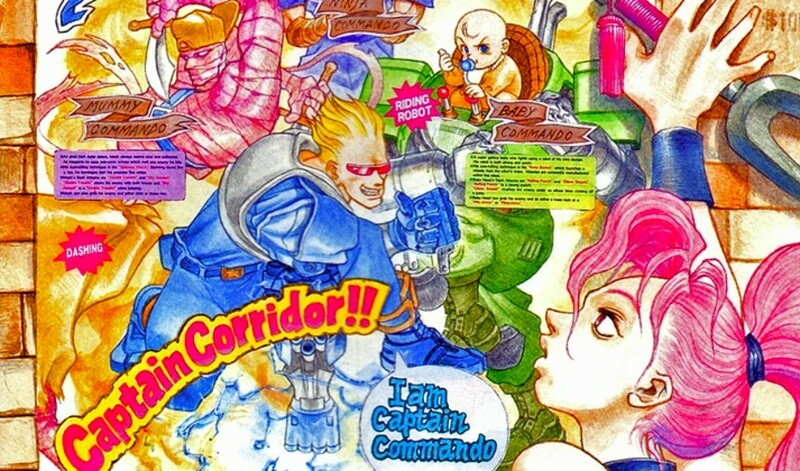 Captain Commando is similarly famous and features a character which is basically a giant robot controlled by a baby - so that's a must-play, naturally. 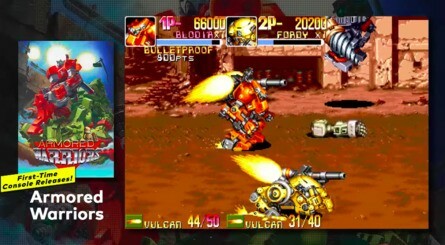 Knights of the Round, King of Dragons and Warriors of Fate are fantasy-style fighters, while Armored Warriors takes places in the same universe as the one-on-one brawler Cyberbots. Finally, Battle Circuit is one of Capcom's most accomplished side-scrolling beat 'em ups, but was released just as the genre was on its way out of arcades and consequently didn't get the audience it deserved; hopefully, that oversight will be fixed with this new release. If all of this sounds rather jolly to you, then you'll be excited to learn that the bundle launches on the Switch eShop on September 18th - next week, to be more precise. Generally excitied for Warriors of Fate! Since going Japanese for my Saturn collection this has been on my hit list. I love Capcom beat em ups, this is a buy! Welp I will be picking up some eshop cards tomorrow. Can Konami go next with a beat-em-up bundle? Tickles my fancy. BIG TIME!!! Very nice, but I'll have to see the price. Capcom doing things halfway again! Why not the other beat em ups as well like the other 2 final fights? Next week at that? Yup, Day 1. Looks like a must buy for me! Damn. Now I have to buy this as well! Perhaps Japan might get one, their Direct showed 2 different prices. This was a surprise! Classic beat-them-ups by Capcom. Hopefully we get a physical version. I've already pre-purchased but this was one of the biggest highlights for me. I cannot wait to play these games! 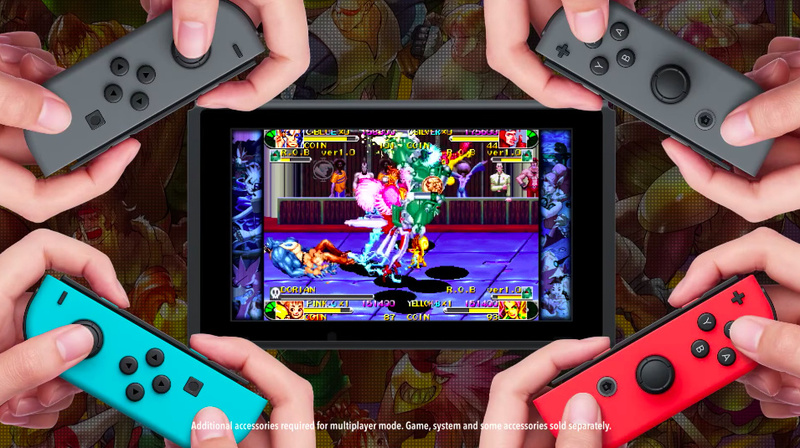 I was literally thinking last night "Wouldn't it be cool if Capcom released an a bundle of their old arcade beat em ups" and lo and behold they did it. This looks solid but not at $20. I'll wait for a discount. Highlight of the Direct. Can’t wait to beat up everything. Dragons, punks, robots, I don’t care. Line em up, and I’ll punch em all. It's like Capcom was spying on that Streets of Rage thread .. beat 'em ups! Argh damn them why digital only. : That's a really nice selection of games. If only Konami could do that with its licensed games. I actually cheered out loud when this appeared and then shouted "Yesssss" when they said it had online Co-op, then again but even louder when I saw it is coming next week. For me, it's one of the best Switch announcements yet,let alone in this Direct. Only $20 as well, just amazing. I was ready to pay $50. I might be showing my age, but this was the highlight of the Direct for me. Already downloaded. Would love a physical cart with these games bundled. It's going to be hard resisting the digital release! @GameOtaku Well, it is an arcade collection. The other two were console exclusives (then again, that didn't stop them from putting Super Ghouls 'n Ghosts, a console exclusive, in Capcom Classics Collection). Would be nice if these are on physical cartridge instead of download but oh well either way it's nice to finally have arcade perfect version of Final Fight on the go. Exactly my point. So the very reason 2 and 3 aren't on the collection is strange just like the omission on alpha 3 upper and alpha 2 gold on the SF collection despite the fact both had an arcade release. @OorWullie I'd have paid for them individually if it came down to it! The whole Capcom beat-em-up collection (minus AvP, The Punisher, and Saturday Night Slam Masters) for $20 is a steal! This looked like an amazing collection when I saw the announcement on the Direct. Now I’m hearing is $19.99? How can anyone not be excited for this? Day one. These games are all a must RetroPie! I mean a must buy (of course). A must buy for me. Now give us the Capcom shoot-em up bundle!!!! @Captain_Toad What beat-em-up's did Konami do? DAY 1!! I grew up on Arcade Beat 'Em Ups and all of these are top notch! This was easily the most pleasant surprise of the Direct last night! Now if they could only release the licensed titles too..."Cadillacs & Dinosaurs" especially! Also "Asterix", "The Simpsons", "Violent Storm" (and its prequels), "Metamorphic Force".... all of them absolutely top-notch! @masterLEON Yep, I would have too. It's superb value! There's someone complaining in the forum thread too, calling it anti-consumer, unreal! Hopefully the 2 SEGA Ages games arrive in the west next week, I'll be in retro-online heaven if they do. plus 18 more NES games and 5 more Capcom beat-em-ups all with online to boot. Amazing! Digital only...again. I'm sure Capcom will stuff up Ace Attorney too. They'll do a Mega Man on that collection for sure. I love Final Fight but I don't really know much about the other games. It seems like good value though. It would be nice if Konami did something similar, but I'd settle for Hamster just bringing Gradius at some point. Armored Warriors sold me enough. Now I wished Switch had Cyberbots. Good, but digital only? Well, that means we don't have to buy it day one, and while we wait it will get on sale at some point, or a physical release will be announced. No rush. Cool, but the one I was really hoping to see as soon as that announcement started rolling was Dungeons & Dragons: Chronicles of Mystara. Alas, not this time. Casting Sticks to Snakes all the time will have to wait. @SmaggTheSmug I was thinking the same thing too, absolutely loved Mystara back in the day. Great collection and super excited for it, but Capcom forgot The Punisher, which IMO is much better than Captain Commando. Oh well, can't have it all I guess. Day 1 tho I bet no hard copy! Not interested, has everyone forgotten about Golden Axe?? Too bad some of the best ones are left out. What is here is still great though. I’d still like to see that Disney afternoon Collection guys cmon! That’s 6 Classic Nes Games and should go with the Switch like franks n beans!! What with this and the recent SF Collection, what I really, really want is a Darkstalkers Collection, please. Thank you, Capcom. Thank you so much! During my ROM days on PC (many, many moons ago), these were my staples. I am so happy that I can have these games legally and can play anywhere! I can’t wait for release! @Moroboshi876 I thought about that, but my worry is that hardly anyone will be online playing if I wait for later to pick it up. Heck, maybe no one will be playing online when it's new! @Bunkerneath Isn't Golden Axe a Sega game? Easily the best announcement on the Direct! This is a great collection. Capcom made fantastic beat-em-up games. Too bad licensing gets in the way of some others like The Punisher and Cadillacs and Dinosaurs which are excellent. I always wondered why Capcom hadn't released Armored Warriors or Battle Circuit which are also excellent but without licensing problems. Those two make this set worth it alone. I also like Knights of the Round and Captain Commando. King of Dragons I could never get into. Same for Final Fight which has a different feel from Capcom's other stuff. @insertcoin2play If this compilation's online works as bad as SF, doesn't really matter. But if I had to buy a game for its online portion knowing than in a couple years nobody will be there, I wouldn't. I want games I can play forever. @Moroboshi876 Oh, I'm playing this sucker forever; I'm not getting it just for online play. I just feel the best chance to play this thing co-op without having to gather people for couch co-op is to get online while it's new. But you're right, I'm not sure there will be enough people playing online to begin with. I just pre-bought this! Can’t wait to play these games on my Switch. I dunno about other places, but in Japan just Knights of the Round or King of Dragons loose for SFC run twice the asking price of this set. It’s an absolute steal price wise. There should be an online mode where you can play as any of the characters in the collection just so there can be an all out fight. 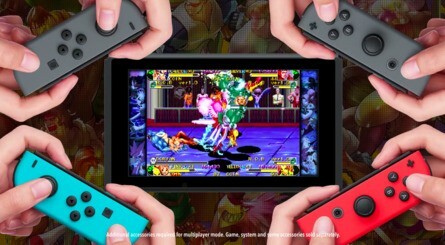 @GameOtaku Maybe because a good chunk of the potential customer base (myself included) already owns the Virtual Console versions of "Final Fight 2 & 3" on the Wii or Wii U? Anyway, this package sounds amazing! We finally get the arcade version of "Final Fight" on console (although it does have an excellent GBA port, it's much simpler and easier to play multiplayer on a console, plus you get a much bigger screen even in handheld mode), as well as a bunch of other good SNES beat-'em-ups that are very hard to find used copies of at a decent price. They've missed off the Dungeons and Dragons games? @Beatley82 sorry to disappoint you lol. I've actually never played any of the games on this collection so I'm not ready to jump in on them. Especially with the classic games coming out next week through the online service.. Not to mention, Sega ages is coming next week I believe. I'm not saying it wont be a good bundle but I'll spend my $20 elsewhere until it goes on sale. @Chrismakem I don't know if you know, but the D&D games were released on last-gen systems and PC as a package, so they're already available and a possible reason for not being included here. Also, I suspect the fact that those two games have a license attached to them is another reason for them to be separate. Perhaps they will consider bringing the D&D package to Switch if people want it. I never needed them for last gen as i have it for my Sega Saturn, just thought it would be cool to play on the go! @KingMike I remember Wild Cowboys! @Mach_Rider I loved the NES TMNT game & the Simpsons Hit & Run!